The purpose of a Device Database – also referred to as datasets in the SDK – is to provide the AR application with a locally accessible database of targets. You may download multiple device databases to include with your Vuforia application. Each device database can contain a maximum of 20 Object Targets in combination with other target types. We recommend that you not include more than 1000 targets (not including Object Targets) in a database. 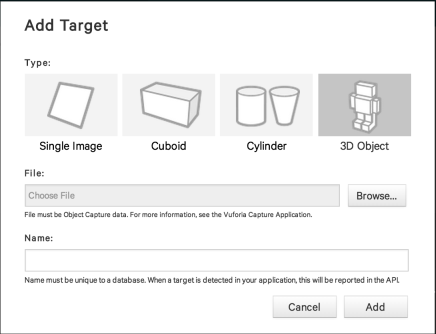 The Vuforia Target Manager allows you to create and manage Device Database s and the targets within them before they are downloaded. For more information, see Getting Started with the Vuforia Target Manager . Device databases provide your AR application with a locally accessible database of targets. You can include multiple device databases in your AR application. The Target Manager allows you to create and manage those databases online, and provides download options for both Unity and native projects. This article will show you how to create Device databases in the Target Manager. 1. Go to the Target Manager in the Vuforia Developer Portal. 2. Press Add Database. The Create Database dialog opens. 3. 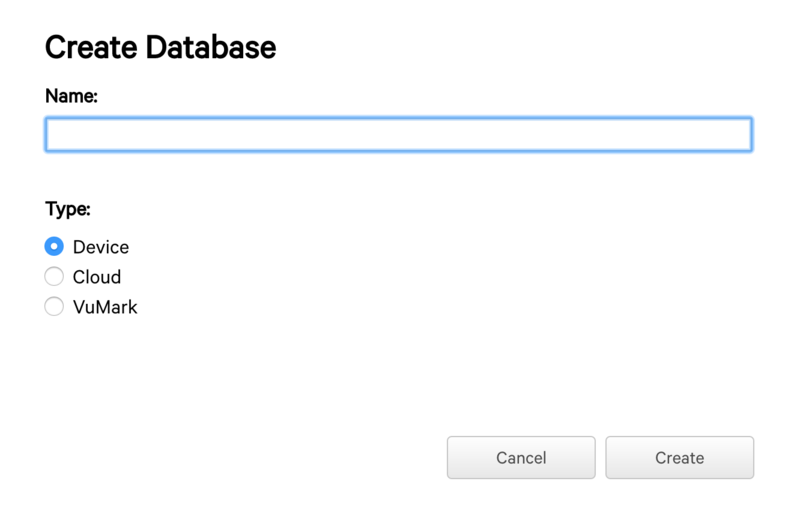 Name the database and select the Device database option. The database name should be unique for the developer account you are using. 4. Press Create. You'll be taken back to the Target Manager database list. 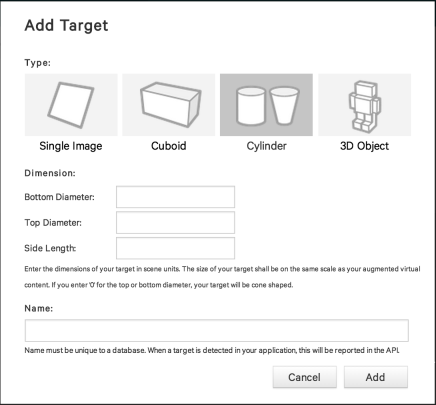 Object Targets, Image Targets, Multi Targets and Cylinder Targets are created and managed using the Target Manager. 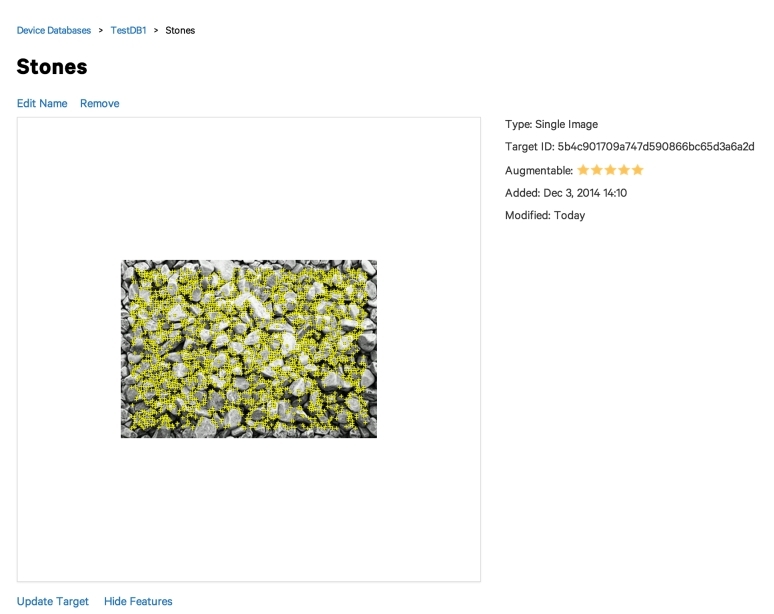 The recommended maximum size for a Device Database is 1000 image-based targets (max 20 Object Targets), though it is possible to support a larger number of image-based targets depending on the images used. You'll need to test your datasets to confirm whether they'll work with more than 1000 targets. 1. Go to the Target Manager Home Page. You will see a list of existing device databases. 2. In the list of databases, find and click the name of the device database in which you want to add a new target. 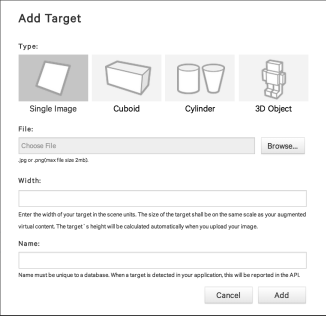 The parameters that you'll need to define for a target differ by target type as does the workflow for assigning and configuring target assets, such as images and object data files. 1. Click Add Target. The Add New Target dialog opens. 2. Select the Object Data ( *.od ) file that you want to use for this target. 3. Type a unique name for the target in the Name field. The name must be unique within this device database. The name can only include letters, numbers, and the underscore character _ . 4. Click Add. After a short processing the Target Detail page opens with the result of the upload. 2. Type a unique name for the target in the Name field. The name should describe the image. 3. Select Single Image as the Target Type. 4. 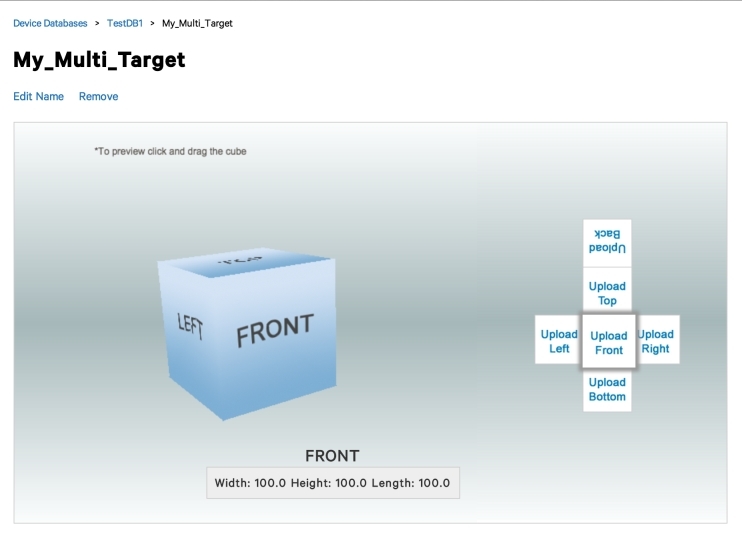 Enter the Width of the target in scene units. 5. Browse to and select the image file. The file must be 8 or 24-bit PNG or JPG. A JPG file must be RGB or greyscale. Maximum image file size is 2.25MB. 6. Click Add. After a short processing the Target Detail page opens with the result of the upload. 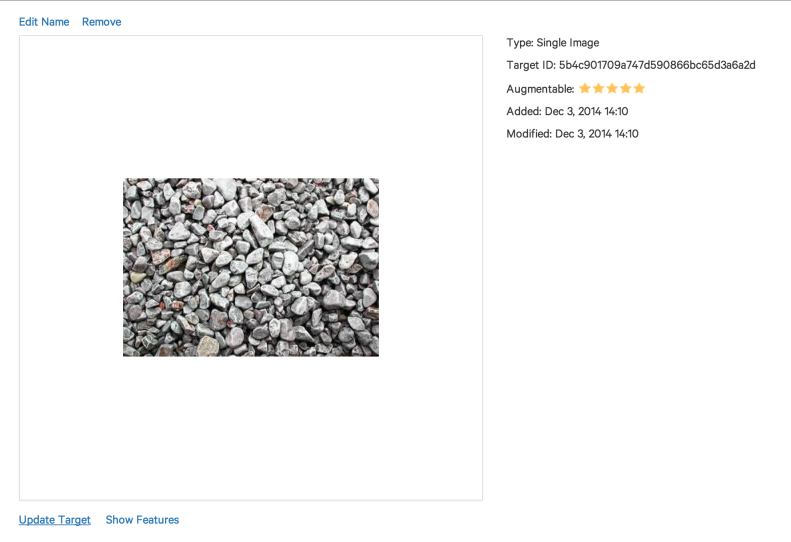 The rating and, if required, improvement recommendations display along with the target image. 2. Type a unique name for the target in the Target Name field. 3. Select Cube as the Target Type. 4. Enter the Width of the cube target in scene units. NOTE: The width parameter is very important, as the pose information returned during tracking will be in the same scale. For example, if your cube target is 16 units wide, moving the camera from the left border of the target to the right border of the target will change the returned position by 16 units along the given axis. Enter the dimension of your target in the same scene unit as your augmentation. The size of the target shall be relative to the size of the augmented virtual content. 5. Click Add. A new target container is shown on the list of targets. 6. Click the new target container. A window opens with an empty target container with the specified dimensions. There is a 3D representation on the left and a layout view on the right. 7. In the 3D representation, click one of the links (e.g. Upload Front) on the layout view. 8. Browse to and select the image file that you want to place on that surface. The file must be 8 or 24-bit PNG or JPG. A JPG file must be RGB or greyscale. Maximum image file size is 2.25MB. 9. Click Open. A progress indicator will notify you when the upload is complete. NOTE: The image file must be square. If the aspect ratio is not appropriate, a message indicates the expected aspect ratio of 1:1. Do not use the same image on multiple sides as it can create false information upon detection. 13. Repeat steps 9 -11 for each of the other surfaces of the cube target. Use the breadcrumbs on the page to return to the list of targets for this database. NOTE: You do not have to upload all six parts, however there must be at least two surfaces associated with images before you can download a device target database that includes this multi-target. The name must be unique within this database. 3. Select Cylinder as the Target Type. 4. Enter the Top Diameter, Side Length, and Bottom Diameter of the cylinder target in scene units. Enter the dimensions of your target in the same unit as your augmentation. The size of the target shall be relative to the size of the augmented virtual content. If you enter 0 for the top diameter or the bottom diameter, that will make the target a cone shape. 5. Click Add. The cylinder container is added to the target list. 6. In the target list, click the cylinder container you just added. A window opens with an empty 3-D representation of the cylinder on the left and a layout view on the right. 7. 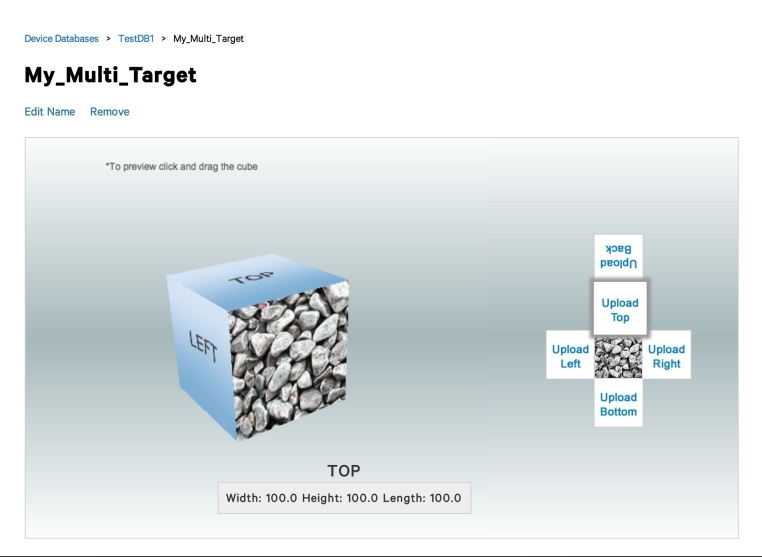 In the 3D representation, click Upload Side on the layout view. You must upload the side image before uploading the top or bottom image. The image file must have the appropriate aspect ratio for the dimensions you provided. If the aspect ratio is not appropriate, a message indicates the expected aspect ratio. 10. Repeat steps 7-9 for Upload Top and Upload Bottom. Use the breadcrumbs on the page to return to the list of targets for this database. 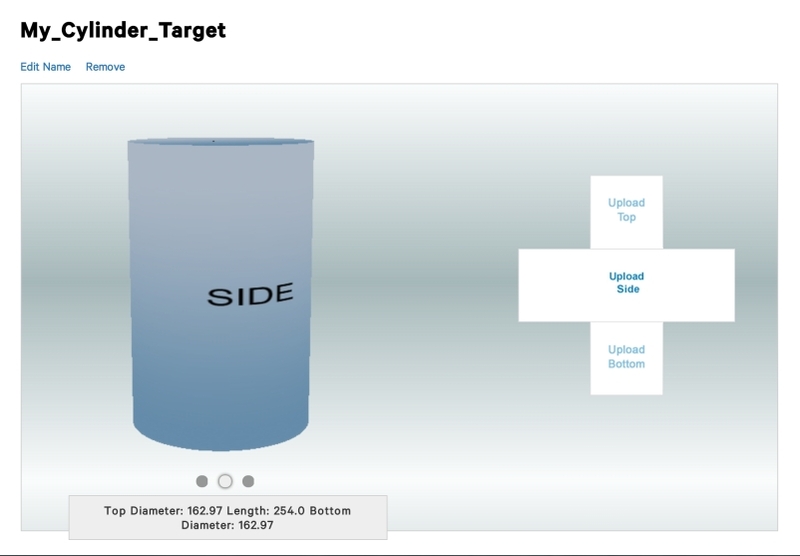 You do not have to upload all three parts; however, associating the Side surface with an image is required before you can download a device target database that includes this cylinder. 2. Click the name of the database containing the targets that you want to remove. 3. Click the check box next to the targets that you want to remove in the target list, or check the box next to Target Name to remove all targets. You will be presented with a confirmation dialog. If accepted, the target(s) will be deleted and the target list will be updated to reflect the remaining targets. You can view your databases and the targets in each database within the Target Manager. 1. Go to the Target Manager page. 2. Click the Device Databases name containing the targets you want to view. For each Image Target the following information is displayed next to the target name. The augmentable Rating for any Image targets. The target status of Active, Inactive or Processing. 1. Click the Target's name in the target list. For Image Targets, the target's properties will be listed to the right of the target image. The Show Features link under Image Targets will show you the contrast based features of the image that are used to detect and track the target. 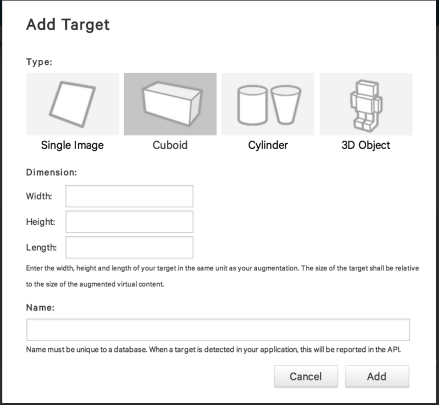 For Multi Targets and Cylinder Targets, which are composed of multiple target images, you can view the details of the individual images by clicking on them in the target's 3D viewer. 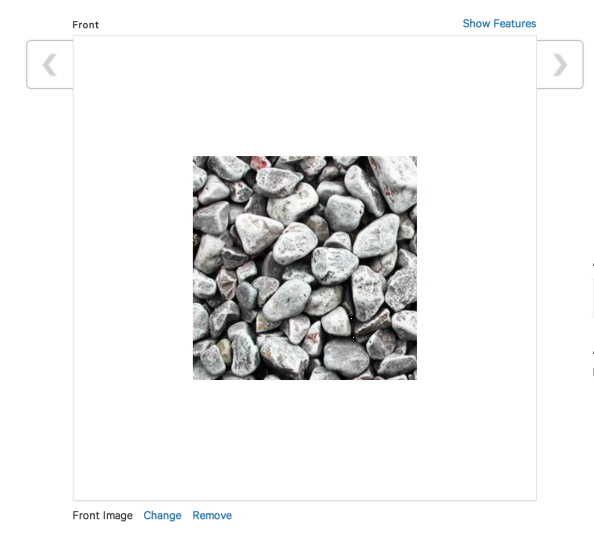 Each image has it's own details page where you can view the image features and also edit the image. You can change the images used for targets and also rename your targets and databases. 1. Go to the Target Manager Home Page. 2. Click the name of the database that you want to edit in the database list, this will take you to the database's details page. 3. Click the Edit Name link at the top of the page, under the database name. 4. Define a new name for the database in the Edit Name dialog and click Save. Use this procedure to download in a Device Database. You can choose to download the database as a *.zip archive or a *.unitypackage. Select the archive type appropriate to the development tool you are using. 1. Go to the Vuforia Target Manager Home Page. 2. In the list of databases, find and click the name of the database that you want to download. 3. Click the Download Database button. Select the format (SDK or Unity) of the database that you want to download. 4. Click Download. After a short processing time, this action creates a download of the all of the targets. Save this file on your computer. NOTE: For SDK projects, you need to extract the XML and the DAT files of the device database from the ZIP archive. When using the Unity format, simply import the downloaded package to the StreamingAssets folder of your project. Download your Device Database as a *.unitypackage, you can then double click on the package or import it from the Unity Editor using Import > Custom Package. The unitypackage file will automatically import the database files into the Streaming Assets / QCAR folder of your project. Download your Device Database as a *.zip archive. Copy the two target asset files of the downloaded database file in the assets directory of your project. It is important that you do a clean build in Eclipse after you have modified the assets in the directory; otherwise the packager will not include the new assets in your app installer APK package. To rebuild your project and initiate the packaging process, select your project and then go to Project->Clean...->Clean selected project below. This examples uses an ObjectTracker instance to create and load a dataset named myDataset1.xml that is placed in the assets/ folder. 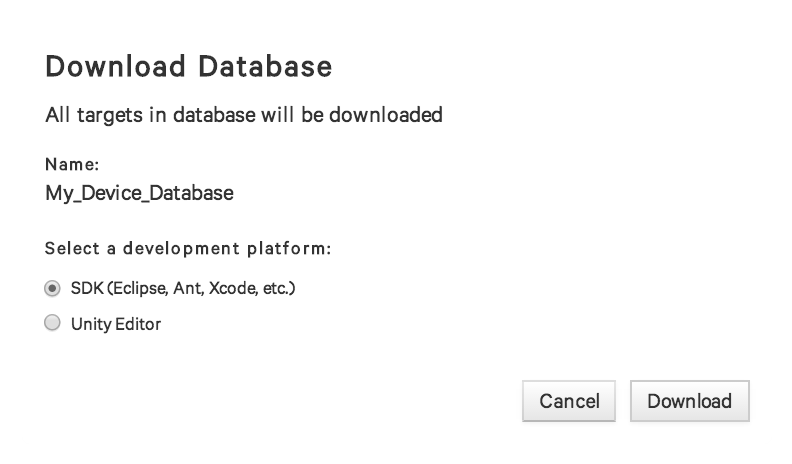 Datasets placed in the assets folder are packaged by the sample Xcode projects into the root of the app bundle. This example uses an ObjectTracker to create and load a dataset named myDataset1.xml which is present in the root of the bundle.